Piso Fare 2019 Promos Until 2020: 99 Piso on it's International Destinations, 90% Off in all domestic flights! 99 Piso on it's International Destinations, 90% Off in all domestic flights! 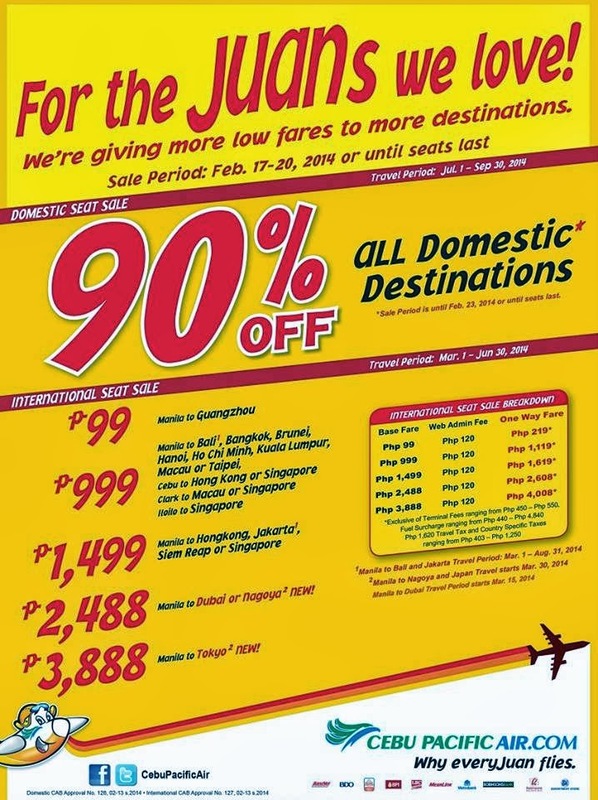 Piso fare: Cebu Pacific is giving you a 90% Off in all their domestic flights! Of course, do check out some of their promos for their international destinations! This is the best time to grab this chance and plan your travels anywhere in the Philippines! Mark your calendars, prepare your diaries and make sure your save money now for your trip! But of course, book your tickets first! Manila to Dubai or Nagoya2 NEW! 90% OFF ddiscount is applicable on DOMESTICfares only inclusive of 7 kg hand-carry baggage allowance. The following fees shall apply after discount: Php 120 Web Admin Fee, Fuel Surcharge ranging from Php 200 – Php 550, Terminal Fees ranging from Php 50 – Php 200, and check-in baggage. Quoted INTERNATIONALone way fares are inclusive of Base Fare, Php 130 Ticketing Office/ Call Center admin fee (Php 120 admin fee for bookings created on the web), and 7 kg handcarry baggage allowance but exclusive of Php 550 International Terminal Fee, Php 1,620 Philippine Travel Tax, Fuel Surcharge ranging from Php 440 – Php 4,840, Country Specific Taxes ranging from Php 403 – Php 1,250 and check-in baggage. AVAILABLE NUMBER OF SEATS ON-SALE PER ROUTE and v.v. DOMESTIC: MANILA TO: and v.v. INTERNATIONAL: MANILA TO: and v.v. Promo fares have limited availability and are non-refundable but rebookable subject to the following rebooking fees: Php 1,200 for Domestic destinations, Php 2,000 for Short-haul International destinations and Php 2,500 for Dubai plus fare difference. Please note that booking fee rates range from Php 120 –Php 200 depending on purchase channel. For your convenience, flight changes, availing of prepaid baggage allowance for check-in baggage and web check-in service can be done up to 4-hours before scheduled flight.